which potentiameter for mid control? Topic: which potentiameter for mid control? I want to install a 10K pot for mid control in my silverface Princeton where the power outlet is. Should that be linear or audio? A traditional Fender tone stack uses a 10K Audio for mid control. Just fwiw.....a number of years ago I convinced myself that I needed a mid control on an already fairly hacked, rehoused SFDR I'd just gotten. I put it in the ext. speaker jack. It worked exactly as intended. I played it for a while until I found the sweet spot where I was probably going to end up setting it and forgetting it. Out of curiosity, I disconnected the pot and measured its setting. 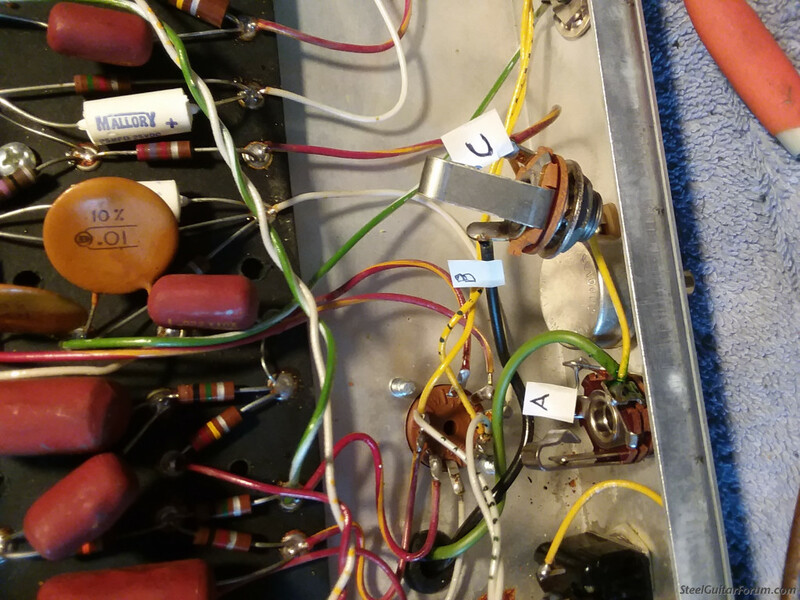 It was nearly exactly the value of the original fixed resistor. I notice the Fender Blues Jr amp has a Mid control. I have often wondered if it would be a good Steel Amp in the Princeton-Reverb size/volume range. I'd like to have the option of the natural Fender scooped sound in some cases, but since the Princeton has no mid like the Deluxe, the variable mid mod sounds useful when playing my ES125 for fatter tones for vintage CChristian bop or western swing. I'd love to have a Deluxe too but may have to build my own from a kit. I'm assuming that this is a "vintage" SFPR. I am a fan of doing mods that are least invasive as possible. Although yours could be easily reversible, there is another way. Replace one of the existing pots with a push-pull type. Pushed in could be the stock circuit. Pulled out could add/subtract a mid resistor/cap/whatever whose value you'll need to determine with some experimentation. It's a vintage SFP no reverb. Very clean condition everything still original stock aside from the 10" Tone Tubby swap which was significant improvement. Even the original filter caps and no hum yet. I agree about minimal invasive. Actually, after playing a newly acquired vintage es125 w/p90 it sounded pretty damn good and much fuller and louder than the vintage Epi Zenith with K&K transducer pickup I'd been playing before. Backing off on the bass/treble and uping the volume may be all thats needed to dial in the sound. More experimentation needed. Just to be clear, Steven, I wasn't telling you what you ought to do or anything......just sharing a (true) anecdote that I thought was amusing. A testament to Leo, or to whoever gets credit for the circuit. Right I understood Jon. It sounds like in your case, that sweet spot turned out to about 6.8K which is what the fixed resistor is. I have used everything from a 10K to a 50K pot for mids in a Fender build. I have settled in on a 25K personally as it gives a nice range. 50K was a little too much to my ears. I agree with the 20-25K range for a Mid pot. Because of where it is in the circuit, it covers the complete range of the fixed 6.8K or the 10K pot, plus a bit more. The Tweed mid controls were in that range. It sounds like you may be leaning towards not modding the amp. However, I just thought of another method to give you all of the adjustment most mortals could possibly want, and still leave the amp unmolested. I use a shielded cable and just ground one end. If you do that there won’t be a bit of noise no matter where you decide to mount your pot. Now what to do with that ext. spkr jack and it's wires. In the pic the ext sp jack is out of it's hole with the new mid pot in it's hole unconnected yet. Desolder OT black wire (B) now connected to ring of ext. spkr jack and connect it to ring of main spkr jack (A)? solder OT wire (B) to wires(C)now connected to tip of ext spkr jack? Don't disconnect the ext spkr jack at all, just leave it, wrap some tape around it, tweek it out of the way of anything, ground it (since it's now unattached to chassis). Put the 10k mid pot in as well as upgrading the power cord to 3 prong and removed "death"cap. Put the 10k pot in series with the existing 6.8k resistor to get stock setting at 0 and 16.5k on 10. I thought that would boost the mids more than it did. Very subtle change. I ordered a 25k pot... see what that does (in series). In other amps I have used from 25KL to 100KL.